This great photo of The Rollright Stones was sent to me in response to my request for pictures of pagan sites by Carol Tierny, who used to do warden duty at the Rollrights. The Rollright Stones is one of England's most beautiful groups of stone circles. Standing on the Oxfordshire/Warwickshire border, it consists of three sets of megaliths - The Kings Men stone circle, the King Stone and the Whispering Knights. Carol's picture was taken looking from the inside of the circle out, to the south-east side facing roughly towards the Whispering Knights. Carol said: "It really is a fantastic place. I have wonderful memories of walking out into a mist-filled circle; it was early in the morning and the full moon was shining down and making the mist glow turquiose. As I walked into the circle the mist swirled up on either side like dragons dancing in the night. I also remember being at the stones just after Yule, sitting in the cosy wardens' hut with the wood burner warming mulled cider and looking out on the perfect peace of snow capped stones." This picture was taken on a sunny summer day. Thanks very much for letting me use it, Carol, it is lovely! 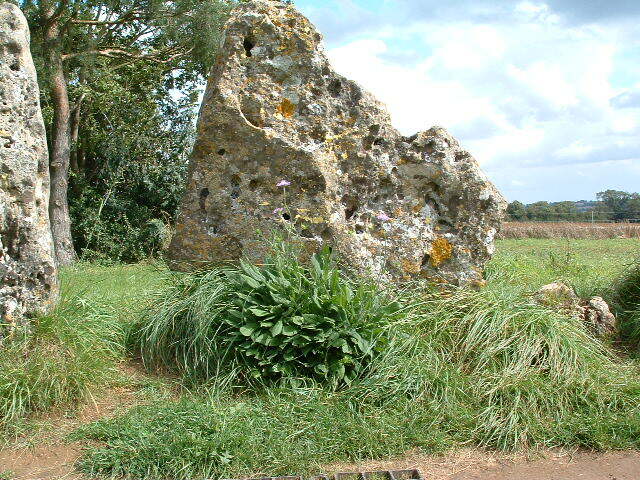 The stones are managed by The Rollright Trust, which conserves them and also enables pagan groups to use them to celebrate the seasons and hold other rituals there.